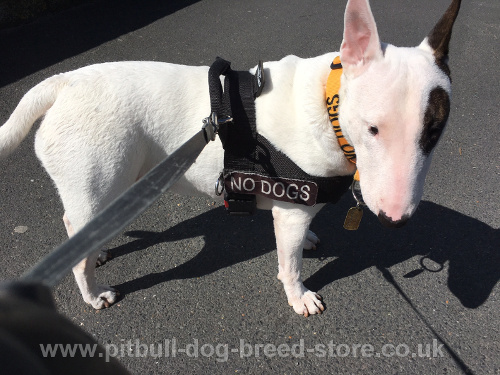 This English Bull Terrier yarness combines the best features of dog training harness, that's why it has become nbe of the most favourite dog accessories and dog training equipment for dogs among our customers! 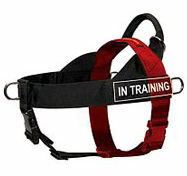 Best dog harness is reliable, strong, designed for comfort and effective dog training. 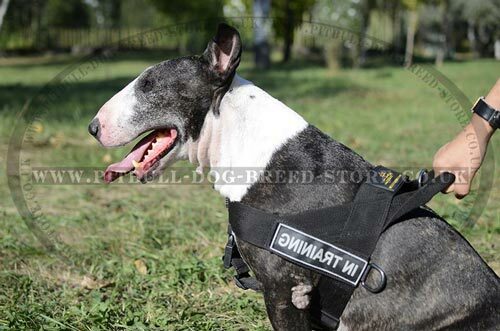 Dog harness for English Bull Terrier is made of strong nylon. It may be used in any weather conditions. 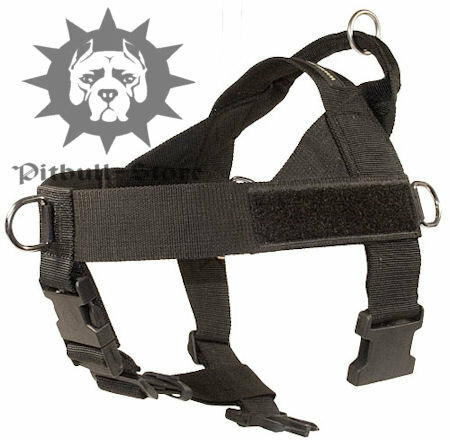 Dog harness with handle will help you to control your dog. If you adjust a dog leash to a front D-ring or to one of the side D-rings, it will stop your dog from pulling on a leash. Side D-rings are also used for weight pulling. There is an O-ring on the handle for leash. All rings are rustproof and cast. 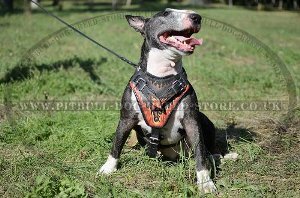 The best dog harness for English Bull Terrier training, tracking and dog walking. 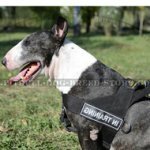 Choose the best quality Dog Harness for English Bull Terrier training, tracking, walking, handmade by professionals. 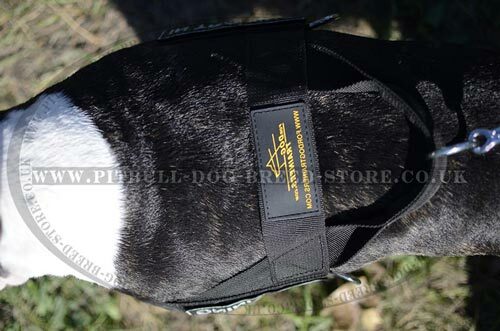 Here you can be sure in the quality of the best dog accessories! Do not forget to fill in the options at the top of the page. Our specialists will pick up the proper size of dog harness according to the sizes of your dog. 1. Hello, Helena! 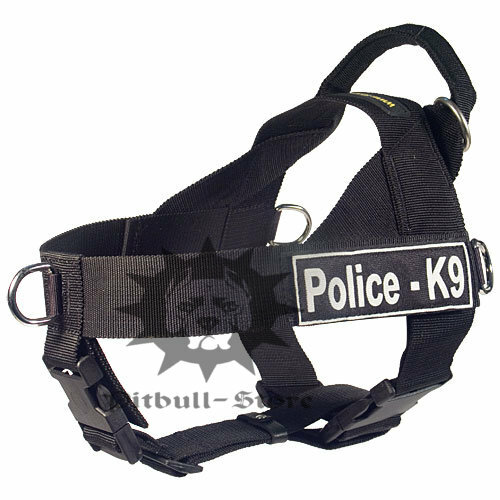 The harness has already been delivered today! Many thanks! Warmest regards! Dear Ms. Steel, thank you for your help and support. 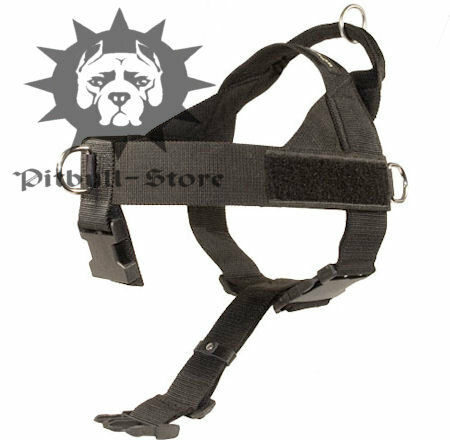 New harness fits the dog ideally. We are happy. We give our positive review, of course.